All the way from the Alaskan Brewing Company comes this little bottle of summer ale, a Kölsch-style limited edition that I’ve been looking forward to for a while, because I really like German beer, and it’s been a while since I’ve been to Cologne, the traditional home of Kölsch. This one’s actually been sitting in the fridge for a couple weeks now, waiting for just the right hot & sticky moment to work it’s way out of the bottle and across my tongue. First impression is of a glowing, golden liquid backlit by today’s unseasonably sunny Seattle weather. Doesn’t look too carbonated in the glass, but it’s got a really decent bubbly feel to it as you sip. Not a lot of head, but very refreshing, good strong flavour and a nice balance between the hops and malt mean this is something I’ll be keeping a supply of around for the next couple months. 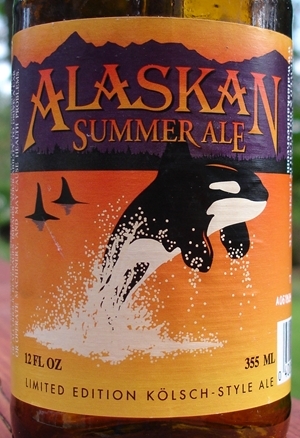 This entry was posted in Alaskan Brewery, Ale, kolsch, Summer Ale and tagged ABV 5.3%, Alaska, Alaskan Brewery, Cologne, For the Win, Fred Meyer, Juneau, kolsch. Bookmark the permalink.